I remember the first time I had real English crumpets. It was during a delightful afternoon tea with my mom at the Orangery in London, and they brought out these delicious English crumpets that we topped with butter, jam and clotted cream. When I returned to California after that trip I was determined to find some English crumpets so I could enjoy them with a cup of tea on a lazy afternoon. The thing I learned about English crumpets is they require minimal ingredients. The real key to getting the crumpets to turn out is by using crumpet rings. We ended up using tuna tins to improvise. You will have to exercise a bit of patience when making these English crumpets since you do need to wait about an hour for the dough to get nice and spongy, but I promise the end result is so worth it! Mix your flour, yeast, salt and sugar in a large bowl. Combine water and almond milk in a separate bowl and quickly whisk the mixture together until nice and smooth. 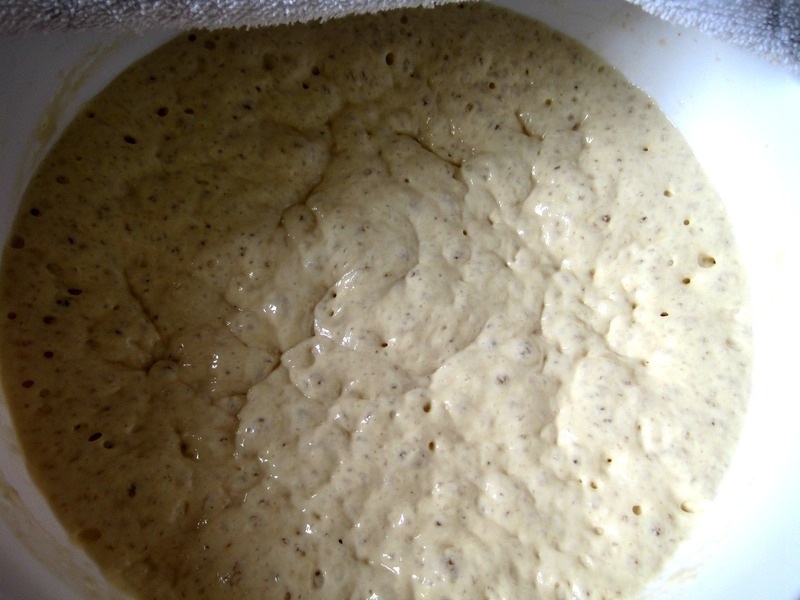 Cover with a towel and let rise in a warm place until spongy, about 1 hour. Place a skillet over medium heat (or 325F). Coat skillet with cooking spray. Coat your tuna tins (or crumpet rings) with cooking spray. Place tins on skillet. Slowly pour your batter into the tins (but not too much). Gently flip the tins over. 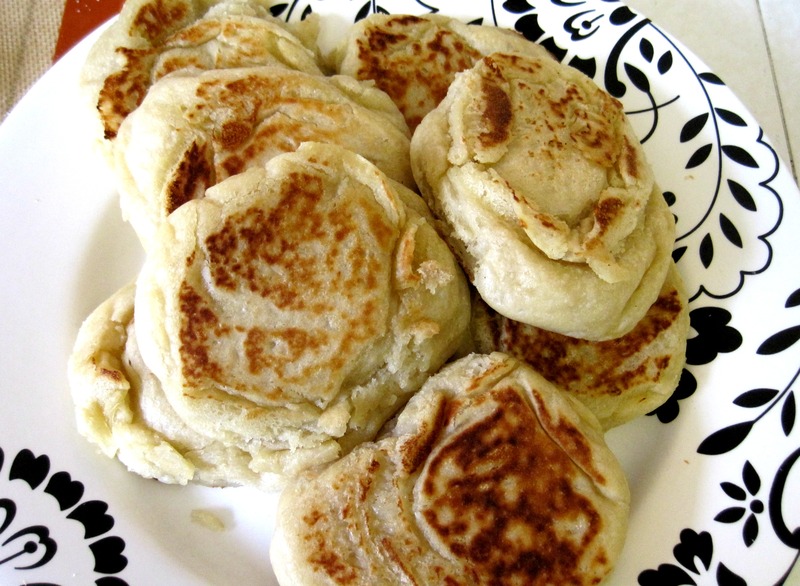 Let crumpets cook on the skillet for 5-7 minutes or until they start to turn brown. Once crumpets start to turn brown, slowly remove the tin lids. Flip the crumpets in the skillet so both sides are browned evenly (another 3-5 minutes). Put crumpets on a plate and enjoy! As you can tell our English crumpets kind of expanded a little too much. That’s due to the fact that we put too much batter in the tins. 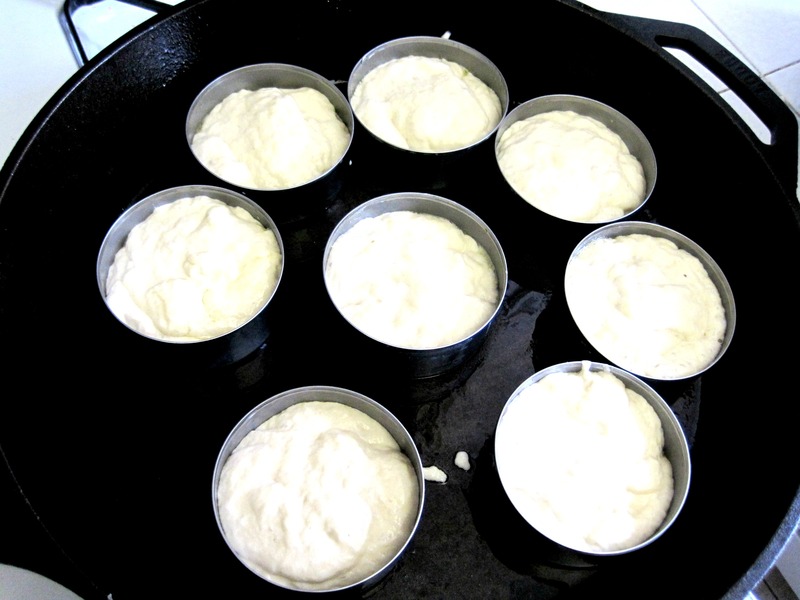 Make sure they are well cooked and springy before removing the tin lid to help ensure that the batter does not overflow. These crumpets taste amazing with some raspberry jam and butter on top. This entry was posted in Breads and Baked Goods, Cooking and tagged crumpets, english crumpets, english food, homemade english baked goods on February 2, 2013 by allie@sweetpotatobites. Glad you enjoyed these, although I’m sorry to say that these look nothing like crumpets, more like an English muffin. Crumpets are cooked on one side only with the other side full of holes, a bit like a pancake before its flipped over. Bicarbonate of soda is generally used as well to ensure lots of holes. thanks for the tip! I definitely want to give these another try to do them right. Thanks for the link! These crumpets look delicious 🙂 You have motivated me to try them again! OMG! I loved the crumpets when I went to the Orangery, too! This recipe is now on my must try list!